For over three decades, Francis D.K. Ching's integrated, comprehensive approach to presenting the elements of architecture and design has helped millions of students and professionals alike visualize and make sense of complex concepts. 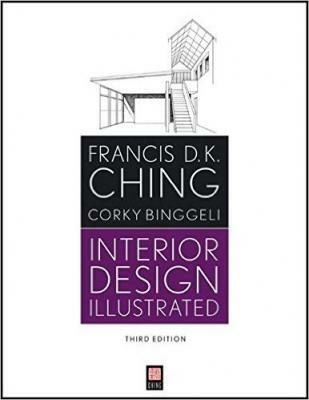 As functional as it is beautiful, this richly illustrated Third Edition of Ching's classic, Interior Design Illustrated, is a visual introduction to designing for interior spaces, to the building elements and environmental systems within them, and to the details of furnishings and interior finishes. Beginning designers will appreciate this updated and expanded edition's for its concise and accessible presentation of key concepts and practices, while established designers will cherish it for its many practical insights into the relationship between building structures and interior spaces. Updated and expanded for a new generation of students and practitioners, Interior Design Illustrated, Third Edition is sure to remain the standard reference for many years to come. Francis D.K. Ching is Professor Emeritus of Architecture at the University of Washington. He is the author or coauthor of numerous architecture and design books, including Design Drawing; Architectural Graphics; Architecture: Form, Space, and Order; A Global History of Architecture; Building Construction Illustrated; and Building Codes Illustrated, all from Wiley. Corky Binggeli, ASID, is a principal at Corky Binggeli Interior Design in Boston and has taught at Wentworth Institute of Technology in Boston and Boston Architectural College. A professional member of ASID and past president of ASID New England, she is the author of Graphic Standards Field Guide to Commercial Interiors; Materials for Interior Environments; Building Systems for Interior Designers; and coeditor of Interior Graphic Standards, Second Edition, all from Wiley.